Most people would probably answer this question in any number of ways that generally relate to everything but the coffee itself. Whether you like a light or dark roast, take your coffee black or with cream and sugar or whether you’ve gotten your personalized Starbucks drink down to a science, all of those are valid personal tastes that have to do with your enjoyment of coffee. If we were to strip all of the accoutrements away though and just ask what kind of coffee we enjoy (i.e. where it’s from), I’m not sure I have the answer and I supposedly really love coffee. If I liken it to wine, it’s like saying I prefer red over white and could really care less where it comes from, as long as it’s red and served in the right glass at the right temperature. I’m much pickier about my wine than that and this week I vow to be the same with my coffee. It takes a lot to enjoy the nuances of the bean itself since there are a lot of factors that can get in the way. If the coffee has been roasted too dark, you’re pretty much just tasting the roast. If it’s older coffee it’ll have lost most of its flavor and aroma and if it hasn’t just been ground before brewing it will also seem more generic. 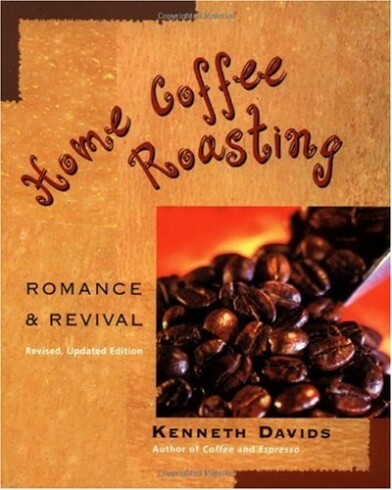 Home Coffee Roasting by Kenneth Davids is a good guide to learning more about the nuances of coffee. It comes with the home roasting kit from Sweet Maria’s. It’s a quick and easy read to get up and running without feeling like you need a degree in roasting. I will be roasting and brewing a different single origin variety each day and taking notes on some of the differences. I’ll be roasting them on the lighter to medium-dark range, following the notes that are provided so the natural flavors can come out. 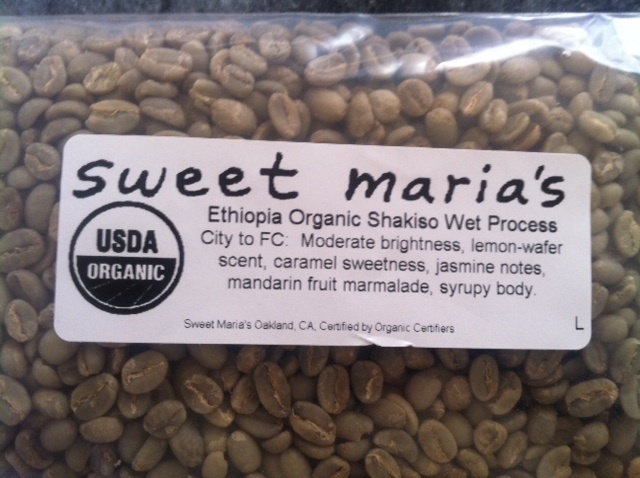 Today I roasted Ethiopian Organic Shakiso Wet Process beans. Again, this only took 10 minutes which you can do once a week and have coffee for the week! It is so easy and even with an uneven roast it’s so much better than the store bought (stale) stuff. This had a kind of lemon verbena quality to it compared with the fruity, floral India Sanskirit from yesterday. I think I may have roasted it a little light since it says it should have a caramel sweetness to it. So far neither of these are my coffee yet but it’s fun to be able to see the distinction. You are currently reading what kind of coffee are you? at 52 To Do.